Unlike stars such as our own Sun some like to go out with a bang. Tom Boles gave us the benefit of his years of experience of how to track down these massive stellar explosions known as 'supernovae'. The first supernova to be discovered by an amateur astronomer was back in 1957. Codenamed SN 1957B, it was a Type 1 supernova and spotted by an Italian amateur astronomer from photographs. As technology has advanced so have the techniques and equipment available to amateurs. 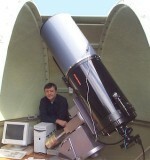 From his home in Suffolk Tom uses two 14-inch telescopes on robotic drives. They are computer-controlled and sweep a vertical band of the night sky 15 degrees across. The images are stored on computer and then he has to begin the painstaking process of comparing each new image with an older reference image. What he is looking for is a bright point of light that does not appear in the older picture. His first success came in October 1997, when he was only the third UK amateur to have discovered a supernova. This was a Type 2 supernova designated SN 1997DN and was confirmed using the 1.5 metre Whipple Telescope in Southern Arizona. Over the years he has discovered many more with his latest sighting in April of this year, SN 2002CC, which is a Type 1. Type 1 and 2 supernovae can be distinguished from each other by looking for hydrogen lines in their spectra; they are absent in Type 1. Type 1 events occur when, in a pair of stars, the smaller of the two siphons material off its larger partner until it reaches a certain critical mass. This increase in mass triggers a runaway thermonuclear explosion similar to that of a huge hydrogen bomb and the star literally explodes. They are brighter than Type 2 explosions and because they produce the same peak brightness each time they explode they are used as astronomical distance markers. Type 2 explosions involve a different process and mark the end of life for a single huge star. Over millions of years the star will have been producing heavier and heavier elements as nuclear reactions take place at its centre. The energy from these reactions supports the "weight" of material that makes up the rest of the star. But a point is reached along the production line where energy is no longer being made but is actually being used up. The stars outer layers are no longer being supported by any sort of energy pressure and collapse violently inwards. They only stop when they hit the stars core and rebound outwards into space. It is thought that in our galaxy a supernova should occur on average about every 100 years. However, whether we will see it depends on a number of factors, including how much dust obscures our view or whether anyone was looking in the right direction at the right time! The last recorded explosion was in 1604 in the constellation Ophiuchus, seen by the eminent astronomer Kepler. On a clear night Tom hopes to image over 100 galaxies an hour but often the British weather puts a stop to his work. If he does get a number of clear nights then his passion for the subject carries him through, observing for 4 or 5 nights in a row. For he knows that he has some tough competition from places in the US where skies are clear and the weather dry for most of the year.